Just posting photos can be pretty depressing when all your excitement and hard work are met by nothing more than a few likes from a handful of followers. You need to know the benefits of social media marketing. This post will help by giving you some methods for improving your followers. You’ll understand that a lot of the ways below are focused on improving engagement because lasting engagement naturally leads to followers. Use popular or known hashtags to help increase followers, for example, #l4l (Like for like). According to the strategy from Neil Patel, like hundreds of random pictures from users in your target audience can gain around 6.1 more followers for about every 100 likes you did of random pictures. Run a contest on your Business account on Instagram. One of the easiest methods to do this is to post an image that promoting the contest and then ask viewers to like it in order to enter. Promote your Business Instagram account on your other social accounts. Once they’re following you, tell people what they can expect. comment and Like on other users’ posts. This is the natural tactic to receive new followers. To get found your image in search, use popular hashtags. Some instance of the most popular hashtags is #love and #photooftheday. According to research, the most effective time to post is 2 am or 5 pm. Look for people who are using popular hashtags like #followme and follow them. Many of them will follow you back. Keep in mind that you need to have quality in your posts because it beats quantity. To leave only the best images to edit your account. Many people don’t like to follow someone with hundreds of pointless images of food or other random shots. According to Track Maven’s Fortune 500 Instagram Report, the single most effective filter for marketers is the Mayfair filter, so use it on your posts. Make sure you complete your bio by using relevant keywords and hashtags and place a link back to your site. Try to be not spammy, this is a guarantee that nobody who sees your profile will follow you! The great way to increase engagement is by asking questions in the captions of your posts. If you want your post get more visibility, post images on Sundays. You need to know why you’re posting, and especially know who you’re posting for. You should be consistent about how you use Instagram and your follower count will increase organically Be consistent. To improve your follower engagement, you can use calls to action to take further action in your photo captions. Maybe you think that some businesses which post many times a day receive lower engagement. Union Metrics show that there is no connection between the number of photos posted and the engagement received, at least you can believe that this relationship is not a negative one. Suggested users might be important on Instagram, so follow them. Click the gear icon in the upper right of your screen to go your Instagram settings then click ‘Find and invite friends’, and next ‘Suggested Users’. If you want to understand which types of photos are leading to the highest engagement, you can use a tool like Piqora, then create and post more of them. The great way to catch the attention of local users, if you have a local business is to use geotagging. While you are geotagging your posts, other people who post photos in your region will see your posts on the location’s page. Schedule and publish your posts on Instagram. Posting consistently is an important key to improving your follower count over time. A tool like Later can help you to do this. All the tricks, tips and strategies in all the world can’t compete with really engaging on social media platforms like Instagram. You need to like photos and leaving comments. Regularly look for new people to follow, and by responding to comments and questions engage with them. You need to gain maximum engagement, therefore you need to combine multiple photos into a collage. A tool like PicFrame helps you to combine up to 9 photos or videos. Another useful way is asking an influencer to tag or mention your product. Ask for a mention, if you know of an influential Instagram user who has used your product. It could work and the result can be a ton of new followers. According to research, posts that contain photos of things that are blue get 24% more likes than photos that are orange or red. Posting on some days can get more engagement, so a report suggests a post on Wednesdays. Images posted mid-week gain more engagement than those posted on other days. Some research recommends using the word ‘comment’ in your captions because it can get significantly more comments than those without. Dan Zarella founded that image posts with faces gained around 35% more likes than those without, therefore use faces in your photos. Tag people in your posts. This ensures those posts show up in those people’ feeds and makes it more likely, so you can sure that they’ll share them. While you are creating your image posts, you should know that the lighter is the better. Images that have around 65-85% light get about 24% more likes than those that are less than 45% light. Think and generate a branded hashtag. Encourage your followers to use your branded hashtag. This causes your audience to engage with your brand and improves your visibility at the same time. Another good way to get followers is by sharing behind-the-scenes photos. As you know photos convey the personality behind your business. Share photos that display there are real persons behind your logo. Ask a guest to post on your business Instagram account. If you have relationships with an influential, consider inviting him or her to guest post on your account. This is a great strategy for sending your engagement through the roof. Post user-generated images on your Instagram account. Remember, sharing your follower’s images, ones where they’ve mentioned your product or service. This will motivate other people to share images of your products as well. If you have a list of your subscribers’ email, you can promote your Business Instagram account to your email subscribers. Sometimes share a photo in your newsletter then link it up to your Business Instagram account. 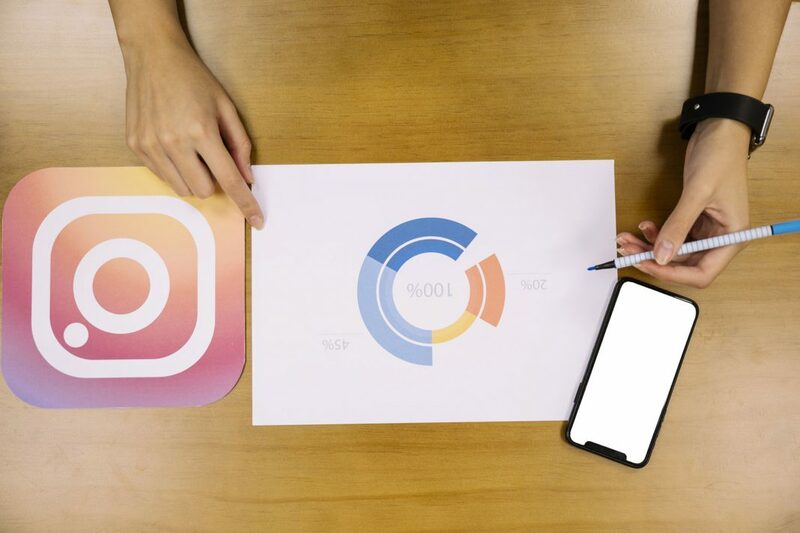 A great strategy to introduce your Instagram account is promoting your Instagram username on your physical marketing materials like signs, product sheets, and car decals, etc. If you have a Facebook account, you need to follow all your Facebook friends on Instagram, and many of them will follow you back. To do this, just go to your Instagram profile and click on the three dots icon on the top right next Select ‘Find Friends’ and then ‘Find friends on Facebook’. Try structures and edges in your images. According to a report, Photos with many edges receive about 125% more likes than those without. Use story feature on Instagram. Tell an engaging story by using your image captions. This way allows you to create an emotional connection to your brand or product. Tag famous Instagrammers for improved visibility and sharing If you’ve been at a live event and have taken photos. Track and Analyze the growth of your account by using a tool like Iconosquare. Understand which images get the view with your audience and post them more often. Crop your images by using a photo editing tool like Aviary then add frames or effects. Some research suggests using the word ‘like’ in your captions because these get 89% more likes. Plan, prepare and then perform it. Being intentional is your best chance at success as with most things in life. At first, make a plan for how you’re going to use Instagram marketing, now to keep yourself on track create a schedule. The good strategy can use image quotes. Those on social media are huge. Motivational, humorous or inspirational quotes over your images using a tool like Canva. Connect your Business Instagram account with your contact list. Click on the three dots button at the top right, and next select ‘Find friends’ to connect to your email contact list. Make a network with Instagram influencers. Look for hashtags related to your business and pinpoint people with high follower counts and engagement. Start developing relationships by Leavening thoughtful comments on their posts. Analyze how your Instagram posts affect your follower stats by using a tool like Crowdfire. Organize co-promotions with other people on Instagram. Look for users who have a similar follower count and organize for mentions to help build each other’s audience. Use a special hashtag to build a community. Create a challenge that your community can participate in and then give it a unique hashtag.